For over 20 years, Cadillac King has been providing the highest quality used and refurbished parts for Cadillac's 1950 to present. 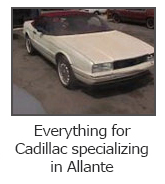 With over 16 acres of Cadillacs, Cadillac King is able to provide those hard to find parts for your classic or late model Allanté. Located in Southern California and in a dry climate your used Cadillac and Allanté parts are preserved in the best possible condition. Copyright © 2019 Cadillac King. All Rights Reserved.